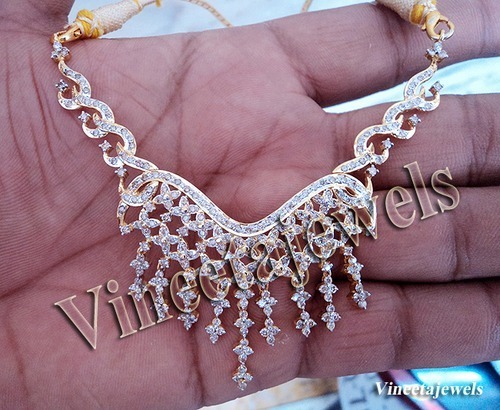 Established in the year 2006, we, “Vineeta Jewels”, are engaged in manufacturing and supplying Diamond and Gold Jewelery. We are not only providing high-quality and classy jewelries to the customers, but also aims to offer a rich and wholesome experience to the customers that they can cherish forever. Every piece of art is important for us, thus we pay utmost attention on even the minutest details, right from the conceptualization till the final production stage. We are supported by a team of diligent professionals and state-of-the-art infrastructure in our journey of jewelry making. With the utmost emphasis on the quality of the ornaments being offered by us, we have become the statement of luxury and customer satisfaction. Besides, our team members have zeal to create beautiful jewelry pieces and maintain life long relationships with our esteemed customers. These professionals also hold expertise in offering highly customized jewelry items as per the demands of our customers. The immense success and growth that we have achieved all this, due to the untiring efforts of our esteemed mentor, 'Mr. Dhirendra Singh'. Its due to his extensive knowledge, sharp business acumen and rich industry experience that have thoroughly supported us in such competitive environment.